Facebook's Messenger app is one of the most popular messaging platforms in the world - it has over 900 million people using it - but the most recent changes are set to surprise some of its users. Facebook has announced in a blog post that it will bring a Favorites section into your Messenger to give you a quick option for those you message most often. 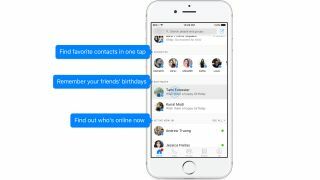 One of the other big changes is that those celebrating a birthday will appear in your Messenger feed so it's easier than ever to message them on their special day. There's also plans for an Active Now section that will give you an option to message whoever is online at that exact moment. It's likely Facebook will bring in some of its new chatbots as well. Facebook will begin rolling out the feature in the coming days, so expect your app to update very soon.